The Google symbol is grey today – not as colorful as it typically is – because of our country’s national day of mourning for George H.W. Bush, our 41st President, whose services are happening now. I appreciate Google’s ability to notify its visitors when something special is occurring. My thoughts immediately turn to one beautiful fall evening in Kennebunkport, Maine where my father and stepmother lived. My husband and I were celebrating our anniversary in an Italian restaurant called Grissini’s when an entourage of serious looking, larger-than-life men who came in all at once, checked out the venue and returned to the front door. 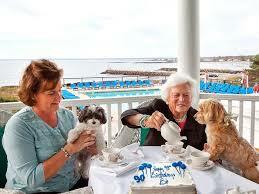 In came Barbara Bush – and we were hoping President Bush – for dinner. She was with a friend and not her husband but from where we sat I could see her lovely white hair over the top of the partition she sat behind. 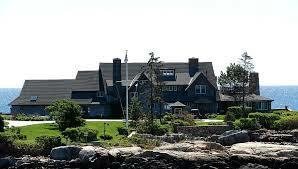 You can’t visit Kennebunkport, Maine and not drive by the Bush estate, with its brown buildings perched on the craggy rocks jutting up from the ocean. What a splendid place to reside. I can see why they loved visiting their magical New England abode with the deep blue ocean spread in front of their windows. 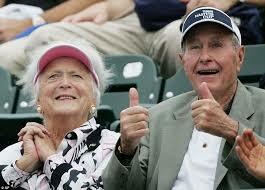 What a treat it was for anyone who caught a glimpse of a Bush family member around town. I am glad I was lucky enough to catch one. When I think of today’s ceremony for our 41st President, I think of the value of leadership and the sacrifice it takes to be a public leader giving oneself for a cause, population or place. In many cases leaders give up their privacy with the intention of dedicating their lives to something larger than themselves to make a permanent difference in life. Even though President Bush is not a female, and I typically don’t highlight men in my writings, today is a different day as Google so poignantly reminded me. Leadership can be hard to define and that’s why on days such as today when we mourn a leader of our country, we look back to observe the unique way they established a distinctive direction to lead others forward with their vision, voice and vocation. Leaders can transform a time and place. We are lucky to witness diverse American leaders who motivate us through their actions. Today’s Wednesday Wisdom should have you contemplating the kind of leader you are within your entrepreneurial venture. Are you someone who leads by example? Do you share your vision for a better way of conducting business with others? Can someone easily share your mission and purpose in leadership with others? How do you sharpen your leadership skills? As the 41st President of the United States lays in rest, never being able to visit his beloved Kennebunkport, Maine home again but only in spirit, I pledge to think of him and the importance of people like him who lead our country forward by giving their life to service of others.